The results of research related to science-based risk assessment of genetically modified organisms (GMOs) are dispersed through an extremely broad range of fields and journals. This interdisciplinary feature makes GMO biosafety research a particularly interesting intellectual topic, but it is difficult to follow new developments across this broad and actively growing domain. 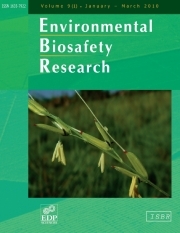 The purpose of Environmental Biosafety Research (EBR) is to fill this gap in scientific communication. All areas pertinent to the biosafety of organisms intentionally or accidentally introduced into the environment will be considered, including: ecological studies of the impact of novel organisms; studies of their interactions with pests, pathogens and non-target organisms; impact of novel organisms on agronomy and farming practice; effect on microbial populations; assessment of horizontal gene flow; means for reducing or managing risk; risk/cost/ benefit analysis; risk governance; socio-economic impact studies; effect of socio-economic behavior on risk and risk management; and bioethical issues. EBR will publish papers on all types of GMOs, including plants, animals and microbes. Studies on non-GMOs that illuminate or parallel GMO issues will also be considered.